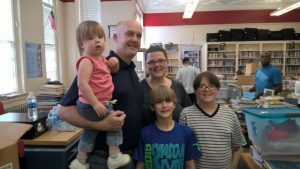 At Capital Heights Middle School in Montgomery, AL, ActioNeter Joshua Z and his family participated in a library/media room clean-up project. 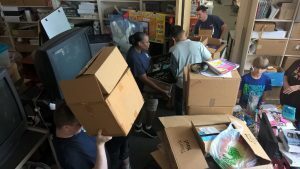 Joined by a group of over a dozen military personnel, they moved boxes and equipment and reorganized thousands of books and reference materials from the computer area and the Librarian’s office/storage space. Team work paid off! The volunteer efforts for an afternoon helped an overwhelmed new Librarian regain order. Ultimately the over six hundred students at Capital Heights will benefit from the revamped space.